It’s Christmas Eve, and I’m sick – and I don’t mean like Tony Hawk. The holidays are here, and just as I found that spirit coursing through my veins – was it the bowl of sugar-cookie dough chilling in the fridge? My admission that I’d definitely split a pizza with Jan from the Toyota commercials? – I get horse-collar-tackled by a rogue virus. A Santa makes his rounds, I find myself with Vapo Rub on my chest, fever rousing me before it’s time to make the donuts, and the realization that the fam might have to do it without me today. I’m happy to share on this very Christmas morning our latest edition of 6 Words. It’s the Christmas special. I’m not talking the Full House or Growing Pains Christmas specials – I mean the Hemingway-prodded means of getting you all to condense the season. To six words, in fact. Happy holidays, y’all, and thanks for the contributions and massive sharing you tend to do for these. I want to make them monthly in 2014, if it doesn’t spoil the magic. I assume it won’t. Pizza Friday sure hasn’t lost its appeal despite faithful observance. Love your six words posts! I really hope you’re feeling better so you can enjoy the day with your girls. Happy holidays, Eli! Thanks Kathy – it’s a blast to round them up, too. I was hoping Santa would fix me up on his way through – but it reeks of pipe smoked and fish sticks in the living room, which tells me he was probably already here. And I still feel like the ‘before’ dude in a Nyquil commercial. Great post and I hope you feel better, very soon. Thanks Ann – I’m going to do my best *not* to give the gift of a virus to my three angels today! This is really great, Eli. You did a wonderful job coordinating this. I really enjoyed seeing the creative and witty thought-provoking six words people had. Really cool. Merry Christmas! Hope you’re feeling better soon. Thanks Kate. I try not to ask the same person every time, and get a good mix for each one. Some contributors use their powers for good, others for evil. Glad you liked it, and thanks for playing along! Merry Christmas to you, too. Pass the Nyquil. Or bourbon. Either/or. So cool, Eli! It’s neat to see all the different perspectives. Thanks Jennifer – it’s amazing to see the good and evil we can achieve in just six words! Glad this batch included you. Merry Christmas to you, too, and I think the team will bench me for this all-important pancake duty this morning. Germ boy just might have to get waited on! Lovely post. Merry Christmas. Happy holidays. Thank you Indira. Merry Christmas to you. I waited for a knock on the door yesterday – on Christmas Eve day – for the delivery of the last gift by U.S. Mail! Thanks Jen – I’d been wishing for a sick day to stay home and watch dad-like movies from the couch, but I had no idea I’d have to be THIS sick and that it would happen to come on Christmas! So glad you got in on this one. Merry Christmas, Jen. This is beautiful and funny and sprinkled with truth……and a bit of magic; but mostly love. Which oddly – is rather like Christmas. Wishing you all that good stuff and more on this most wondrous of nights! Here’s the thing – I never, ever get sick, and i’d wished out loud recently for a sick day to sit at home and watch guy movies in peace and quiet. I knew this post would be a good combination of all the chaos and beauty that is parenting the last week of December. Despite the virus, I’m quite blessed. Merry Christmas to you too, Rory. I’ll tip back some sort of medication to our friend Ernest today. Love so many of these!! They never disappoint. So sorry you’re sick!? That is wrong on so many levels. Not a bad collection, eh? It’s amazing what everyone comes up with. I’m spending the holiday solo, watching Cat Blanchett moves and NBA basketball. On another day of the year, that might be considered a victory. 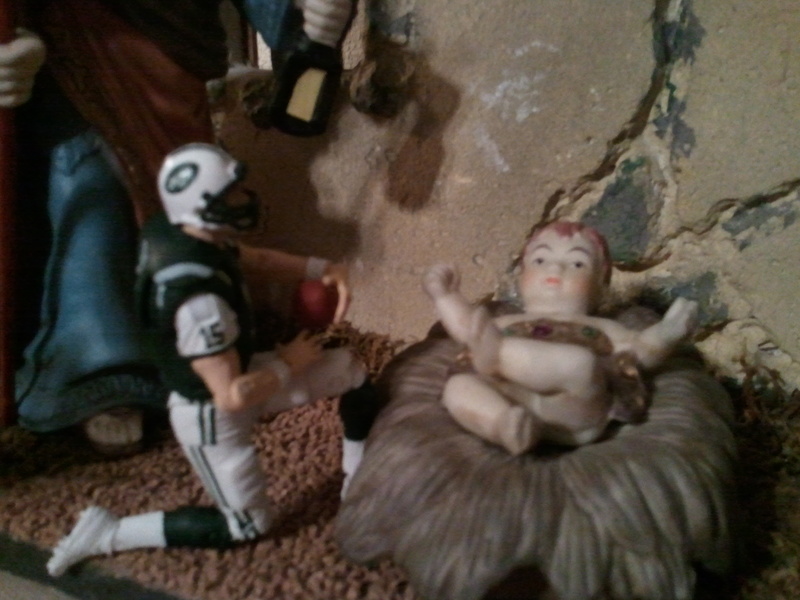 Glad you liked the Tebow and Baby Jesus! He was part of our manger scene, and how could I not share that with the world? Merry Christmas, Eli!! I’m sorry you’re not feeling well. Rest up and enjoy the magic from a safe distance on the couch. Thanks for including me!! Merry Christmas to you too, Rabia. At the moment, the Ibuprofen and such is speaking the loudest, so I don’t feel all too shabby. I hope I don’t give the gift of virus this year! So sorry you are sick. I can commiserate, having come down with a bug two days ago. I am muscle-ing through, faking some smiles and keeping the traditions intact. As a matter of fact, here’s another six words: Monkey bread is in the oven! Merry Christmas! Thanks Sharon! People came through in a big way, as always. The season definitely includes all the love and chaos you see before you. Glad you were part of it. My day has consisted of an incredible Christmas morning, enjoyed from a safe distance, a Cate Blanchett movie (with a January Jones surprise! ), and a grilled cheese sandwich. You feeling better? Moms are pretty good at muscling through to keep things rolling. I swear I heard symphony music when I read about the monkey bread. I think that’ll cure what ails me. Merry Christmas, and thanks, Sharon! Sounds like you have done a fair job of muscling through yourself! Moms and Dads…we make the best of things! Especially on big days like this. 🙂 Monkey bread is pretty amazing…so is a good nap on the couch while A Christmas Story plays over and over and over in the background. Merry Christmas to you and yours, too! I’m honored to have you here as a six-worder and a guest poster. That means you can take two slices of pizza on your first trip through the line – amazing perks. Thanks for the wishes for good health – I think I’ll just have to enjoy Christmas with the fam as soon as I’m not feverish (and contagious). Uffda. I hope you feel better soon! I love this list! Thanks for letting me play along! Uffda, indeed. Thanks NJ, I’m working on my return to good health. Glad you liked how this turned out, and for playing your part. It’s like the ultimate buffet, isn’t it Beth? Glad you brought your own dish. I’ve wanted to keep the girls as far from me as possible – what dad wants to give the kids a nice virus? Merry Christmas to the coach & his all-star team! Thanks again for calling me off the bench to play in the biggest game of the year. Hope you’re feeling better so you can serve up those pancakes & enjoy the day with your girls! Merry Christmas to you and your beautiful girls too, Nicole. You were clutch, the leadoff hitter – that’s no small feat. Everything came off without a hitch – but with me on the couch. Eli, hope you are feeling better soon! Thank you again for including me – love reading the responses from everyone. Hope you are able to enjoy the day despite the cold! Thanks Steph! Thanks also for tossing your sentence into this crazy mix. For solitary confinement, this hasn’t been such a bad Christmas – and I just remembered there are sugar cookies in the kitchen that aren’t going to eat themselves. Baby Jesus..and I would love your pancakes. Feel well fast! This list is fantastic. Heart tugging AND hilarious – the perfect festive mix. I think he would too, you know? And I know you would. The worst part about being sick these last couple of days is the dearth of hugs and kisses to the girls. I miss those. Merry Christmas, Eli! 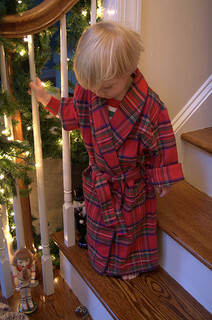 Hope you are feeling better soon – I hear that the TBS marathon of A Christmas Story is good for whatever ails you. Merry Christmas, Dana. I don’t get TBS, so I’ve had to settle for Cate Blanchett and Oklahoma City Thunder vs. New York Knicks. Naps and cookies have come into play, too. LOVE the creativity of these! It’s amazing when they use their powers for good, this tribe. I love these posts! My six words for Christmas… Peaceful day of silly family fun. Merry Christmas to you and your family! I hope you feel better soon! They’re so much fun they’re now a monthly thing. You nailed it on yours – so long as the kids stay a safe distance from germ-boy dad! Merry Christmas to you and yours, too. I’ll try! The coughing makes me feel like I have rock-hard abs (Marie laughed out loud at that one) and my temp keeps going up. But I had a plate of heavenly lasagna and got to watch two basketball games on TV. Great post Eli, get well soon Mate. More Vicks vapour rub and a Merry Christmas. Can you believe I forgot the Vicks last night? I won’t make that mistake again. I can believe it. There’s nothing quite like the smell of vicks. I hope you shake it soon Mate, we don’t want it developing into man-flu. Would you believe, mate, I forgot to do it again last night! It sort of feels flu-like right now, although I felt good when I got up this morning. Now things are starting to ache again. Get well Mate, remember it takes 2 weeks to get rid of if you go to the doctor. Or a fortnight if you stay at home and treat it yourself. I have a new bottle of rum Santa delivered that might get me there a little quicker. Rum doesn’t get rid of it, you just don’t care if you’re sick or not. At this point … that’s not a bad alternative, mate. A hot rum toddy is good though. Big shot of rum, teaspoon of honey top up glass with hot water. After one of them you don’t even care what’s showing on TV. This will be had today, friend. Yes, it will. I’m sorry to hear Vincent the Christmas Virus (it’s a great holiday song – look it up on Youtube) has been visiting your house too. So far we’ve given Hubby a wide berth and a box of wipes and we’re ok. Love #46…you’re probably right! Christmas blessings! Christmas blessings to you too – as soon as I’m healthy, I’mna give Vince a wedgie. Okay, I’m lovin’ 4, 9, 11! 19 is great and 28 is so true ;o) Great post, love the 6 word idea! Hope you had a great holiday! 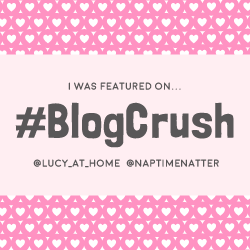 Jennifer, Raine, Sharon and Ashley/Lisa write incredible blogs you should check out, if you haven’t already. Although I will say it’s fun for we dads because our our generally chill nature. Don’t hate us. Aren’t they cool? It is like looking through the windows without having to climb a tree or post bond. especially in the interrogation room. Merry Christmas, Eli! Hope you feel better quickly. You have very creative readers; and I’ll have to participate in your “Six Words” in 2014! Here’s to a great year! Merry Christmas to you, Debbie. It’s early Thursday morning, but I think I just might be on the mend – no fever, fewer aches! Yes, my readers are a creative lot, and asking them to participate in these is a public service – it keeps them off the streets! I’m about to send you an email with the 6 Words prompt for January. Here’s to an awesome 2014. So sorry to hear you are sick. 😦 I hope you get well soon! Another great collection of quotes. Love it! Thanks Leanne – I think the fever’s broken, so it’s just getting the aches and stuffed up head out of the way too. Glad you liked the collection! I think you’ll like the next one too – it’ll be a bit tougher, but you can do it. My favorite part of this whole post is the picture of Tebow and little baby Jesus! Classic!!! I hope you’re feeling SO much better Coach. We need you! Marie took that shot! The Tebow action figure is Grace’s. Conveniently, you can position him in a Tebow, and what better place to Tebow than before baby Jesus? I figure it can’t be that bad, because I’m sure God and Jesus are pretty big Tebow fans, too. So much so that I bet they wished the Saints would sign him. Love the humor and the warmth of these! Thanks for including me, Eli. I love these! I must have missed this one! My favorite is #3…that’s what Christmas is all about to me. I like the quiet time with family. I hope you and your family had a wonderful Christmas and that you are feeling better too! I’ll get you in on the next one, Michelle. It’s kind of random, by design, to get some in the tribe and some from new neighborhoods every time. It was an isolated Christmas, but we’re making up for it today with movies on the couch. At arms length. As always, lots of fun to be included and wonderful to read the submissions from everyone else. Good to know that we’re all going a little crazy! 🙂 Now, on to New Year’s! Glad you were in it. Parenthood without a little insanity in insane, if you ask me. The next prompt will have something to do with 2014 … be on the lookout. This prompt was so much fun! Thanks for having me! It was a blast, Amy. Thanks for playing! #9: “Grab him, he’s eating the paper!” Hahaha! This. Hope you’re up and running soon Eli! There’s that age we want to plop them in the middle of it, when all they want to do is put any of it right in their mouths! I think this ends by age 17 or so. Thanks Kristi – still fever-ridden and Vicks-laden, and hoping for a better Friday! LOVE all of these and OHHHHH so true! Thanks for including me, Eli! Even if the truth hurts sometimes! Glad to include you this time, Marcia. I love these!!! Everyone’s quotes really made me smile, especially the one about decorating with a toddler!! Pretty cool, eh? Decorating with a toddler ought to come with a medal, or at least a patch. Number 12 is my favorite! I was almost going to do something similar 🙂 Thank you for including me in your fun! I read you’re supposed to spray a toddler with a spray bottle when the reach for ornaments, and that takes care of everything. I think John Rosmond said it. Glad you were in the mix, Raine! New reader and I loved the six word posts! Thanks Bonnie – there’s a new one coming the last Wednesday of January, too. What a fun post!! Love them all. Thank you so much for including me. I can’t believe I missed it on Christmas. Hope you are feeling better and that you got to have some fun with your kids! Thanks again! Glad you liked it, Kathy! They all turned out stellar. I’m glad you played along this time. I knew it would get missed on Christmas day, because people had other things to do! I’m having fun with the kids, despite day 6 on the sick couch! I hope I’m better in time to take them to see some Christmas lights. It’s a blast, and I hope the government doesn’t try to restrict it somehow in 2014. Yeah, crap is right. I’m still sick, and have nearly two weeks off of work – I didn’t expect to spend it with cough drops and tissues and thermometers on the couch! Hope you and yours are over your Christmas virus gift, too. Let’s be all healthy. Glad you could make it – who knows, maybe this blog was ground zero for the Christmas Virusaurus Rex 2013. Usually I can spot a favorite but all of these are so good! It’s like trying to pick out the best of the Christmas cookies – you can have all you want, but it’s hard to know which was is best. I’m fever free, and just kinda coughy and snuffly, so I’m about a day away from my old self. Thanks Tricia! Thank you so much for stopping by and saying hi. Luckily, that was last year – I’m healthy this time around …. so far. I wouldn’t have minded another sick-day holiday. I watched a lot of good movies I couldn’t with the kids around, and still got a plate of food and presents. And I was back on my feet for new year’s! This was fun! I should do a new one like this for next Christmas.